We are closing in on the end of zucchini season, but you may still be looking for more ways to prepare them. Here’s a simple idea that will buy you more time when squash just keeps on coming. If you happen to be grilling anyway, throw the vegetables on before or after the main event. The zucchini will benefit from a brief rest in a light marinade of olive oil and herbs: it will give the vegetables a nice boost of flavor and help them not stick to the grill. Zucchini is very forgiving when grilled in whole chunks, as long as the coals are hot enough to mark them. When cooked 6 to 10 minutes over medium-hot heat they will be al dente with plenty of flavor. Enjoy as is, or set aside and use later: as a pizza topping, added last minute to a stir fry, in Greek orzo with feta cheese and oregano, or featured in specialty dishes like lasagna. Combine the marinade ingredients in a large bowl and set aside. 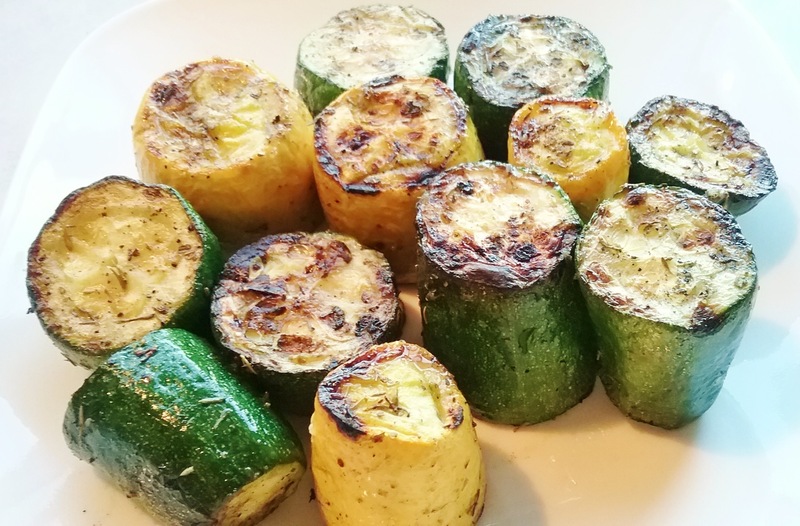 Cut the zucchini and yellow squash into 2″ lengths and toss with the marinade. Cover and let stand 30 minutes or longer. Meanwhile prepare grill. When coals are medium-hot, stand the lengths upright on the grill surface and cook 2-3 minutes or until well seared. Rotate and mark the other end of each length. Place them on their sides and sear around the exteriors. Cook a total of 6-10 minutes, until tender firm. Cool and cut into long 1/4″ thick vertical slices. Brush a bit of the marinade left in bowl over the cut side of onion halves. Roast the peppers and onion in the same fashion as above: char to mark and lightly roast. The peppers should be heavily charred for skin removal; place in plastic bag to cool. Peel off the seared skin, remove stems, seeds, and any heavy interior membrane. Slice the peppers and onion into 1/2″ wide strips and set aside. Next: Next post: A Little Lasagna?